Västra Götalands regionen has introduced a new search solution that Findwise created together with Netrelations. Where both search and accessibility is important. We have also blogged about it earlier (see How to create better search – VGR leads the way). One important part of the creation of this solution was to create an interface that is accessible to everyone. Today the web offers access to information and interaction for people around the world. But many sites today have barriers that make it difficult, and sometimes even impossible for people with different disabilities to navigate and interact with the site. It is important to design for accessibility – so that no one is excluded because of their disabilities. So how do you build accessible websites? One of the easiest things is to make sure that the xhtml validates. This means that the code is correct, adheres to the latest standard from W3C (World Wide Web Consortium) and that the code is semantically correct i.e. that the different parts of the website use the correct html ”tags” and in the correct context. For example that the most important heading of a page is marked up with ”h1” and that the second most important is ”h2” (among other things important when making websites accessible for people using screen readers). It is also important that a site can easily be navigated only by keyboard, so that people who cannot use a mouse still can access the site. Here it is important to test in which order the different elements of the web page is selected when using the keyboard to navigate through the page. One thing that is often overlooked is that a site often is inaccessible for people with cognitive disabilities because the site contains content that uses complex words, sentences or structure. By making content less complex and more structured it will be readable for everyone. How is accessibility related to findability? Accessibility is important for findability because it is about making search solutions accessible and usable for everyone. The need to find information is not less important if you are blind, if you have a broken arm or if you have dyslexia. If you cannot use a search interface you cannot find the information you need. 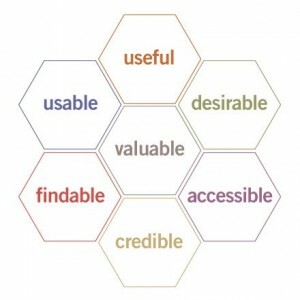 In his book Search Patterns Peter Morville visualizes this in the ”user experience honeycomb”. As can been seen in the picture accessibility is as much a part of the user experience as usability or findability is and a search solution will be less usable without any of them. Do you have your search application up and running but it still doesn’t quite seem to do the trick? Here are six simple steps to boost the search experience. If you have a news search service that only provides yesterday’s news, the search bit does not add any value to your offering. If your Intranet search service provides access to a catalog of employee competencies, but this catalog does not cover all co-workers or contain updated contact details, then search is not the means it should be to help users get in touch with the right people. If your search service gives access to a lot of different versions of the same document and there is no metadata available as to single out which copy is the official one, then users might end up spending unnecessary time reviewing irrelevant search results. And still you cannot rule out the risk that they end up using old or even flawed versions of documents. The key learning here is that there is no plug and play when it comes to accurate and well thought out information access. Sure, you can make everything findable by default. But you will annoy your users while doing so unless you take a moment and review your data. Fact 2: Users tend to search for the same things over and over again. It is not unusual that 20 % of the full query volume is made up of less than 1 % of all query strings. In other words, people tend to use search for a rather fixed set of simple information access tasks over and over again. Typical tasks include finding the front page of a site or application on the Intranet, finding the lunch menu at the company canteen or finding the telephone number to the company helpdesk. In other words, you will be much advised to make sure your search application works for these highly frequent (often naïve) information access tasks. An efficient way of doing so is to keep an analytic eye on the log file of your search application and take appropriate action on frequent queries that do not return any results whatsoever or return weird or unexpected results. The key learning here is that you should focus on providing relevant results for frequent queries. This is the least expensive way to get boosted benefit from your search application. Fact 3: Users do not know what information is available through search. Users often believe that a search application gives them access to information that really isn’t available through search. Say your users are frequently searching for ”lunch menu”, ”canteen” and ”today’s lunch”, what do you do if you do not have the menu available at all on your Intranet or Web site? In the best of worlds, you will make frequently requested information available through search. In other words, you would add the lunch menu to your site and make it searchable. If that is not an option, you might consider informing your users that the lunch menu—or some other popular information people tend to request—is not available in the search application and provide them with a hard-coded link to the canteen contractor or some other related service as a so called “best bet” (or sponsored link as in Google web search). The key learning here is to monitor what users frequently search for and make sure the search application can tackle user expectations properly. Fact 4: Users do not know your company jargon. People describe things using different words. Users are regularly searching for terms which are synonymous to—but not the same as—the terms used in the content being searched. Say your users are frequently looking for a ”travel expense form” on your Intranet search service, but the term used in your official company jargon is ”travel expenses template”. In cases like this you can build a glossary of synonyms mapping those common language terms people tend to search for frequently to official company terms in order to satisfy your users’ frequent information needs better without having to deviate from company terminology. Another way of handling the problem is to provide hand-crafted best bets (or sponsored links as in Google web search) that are triggered by certain common search terms. The lesson to learn here is that you should use your query log to learn the terminology the users are using and adapt the search application accordingly, not the other way around! Fact 5: Users do not know how to spell. Users make spelling mistakes—lots of them. Research suggests that 10—25 % of all queries sent to a search engine contain spelling mistakes. So turn on spellchecking in your search platform if you haven’t already! And while you are at it, make sure your search platform can handle queries containing inflected forms (e.g. “menu”, “menus”, “menu’s”, “menus’”). There’s your quick wins to boost the search experience. Fact 6: Your search application requires maintenance. Information sources change, so should your search application. There is a fairly widespread misconception that a search application will maintain itself once you’ve got it up and running. The truth is you need to monitor and maintain your search solution as any other business-critical IT application. A real-life example is a fairly large enterprise that decided to perform a total makeover of its internal communication process, shifting focus from the old Intranet, which was built on a web content management system, in favor of a more “Enterprise 2.0 approach” using a collaboration platform for active projects and daily communication and a document management system for closed projects and archived information. The shift had many advantages, but it was a disaster for the Enterprise Search application that was only monitoring the old Intranet being phased out. Employees looking for information using the search tool would in other words only find outdated information. The lesson to learn here is that the fairly large investment in efficient Findability requires maintenance in order for the search application to meet the requirements posed on it now and in the future. At Findwise we are currently looking deeply into search analytics for enterprise search, a way not only to assure quality and relevance for your results, but to actually know and understand the users better. Web analytics has been around for quite some time, but there are several things that makes search special. The process of search should always be a dialogue between the user and the search application. Simple: The ‘what‘-questions always have to lead to the ‘why‘-questions. The users doesn’t type a query for fun, they have an intention when doing so. Why do the user ask for a particular piece or area of information? Depending on the intention of the user (specific piece, related or general information), different tools can be used to enhance information retreival. Done right, search analytics can be used for tuning your search engine (weighting of documents, improvements of spellchecking, synonyms etc) and clearly improve information retrieval, but just as important, work as a tool for information quality assurance and management. Within the next couple of weeks this blog will cover further aspects and thoughts on this subject. If you haven’t read Maria’s ‘What differentiates a good search engine from a bad one?’ already, I recommend you to do so.